Composite garden rooms are available to suit a range of applications; a home office, playroom, bar or a place to relax and unwind away from it all. Designed as a self-contained building to use all year round, the innovative construction of our garden rooms utilises purpose designed modular composite wall construction with a core of high performance insulation, to keep the space warm and energy efficient, with a warm weatherproof roof for year-round protection from the elements. With a range of five different sizes, two styles, and four different colours, our eco friendly & natural look garden rooms are the perfect complement to any garden. Looking to buy one of our Garden Rooms? 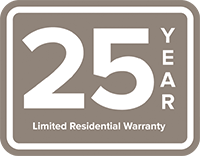 Composite Wood Company Garden Rooms are covered by a Twenty Five (25) year warranty against warping, cracking, splitting, rotting and fungal decay caused by manufacturing defects, when subject to normal use. For the full terms and conditions of this warranty please refer to the Composite Wood Extended Warranty and Terms - Supply of Goods document.